That's No Swimsuit, That's A Racing System After the 2008 Olympics, organizers re-wrote the rules to outlaw Speedo's lightning-fast full-body swimsuits. The company went back to the drawing board and came up with a new system — and it's helping speed top swimmers like Michael Phelps and Ryan Lochte to the medal stand. 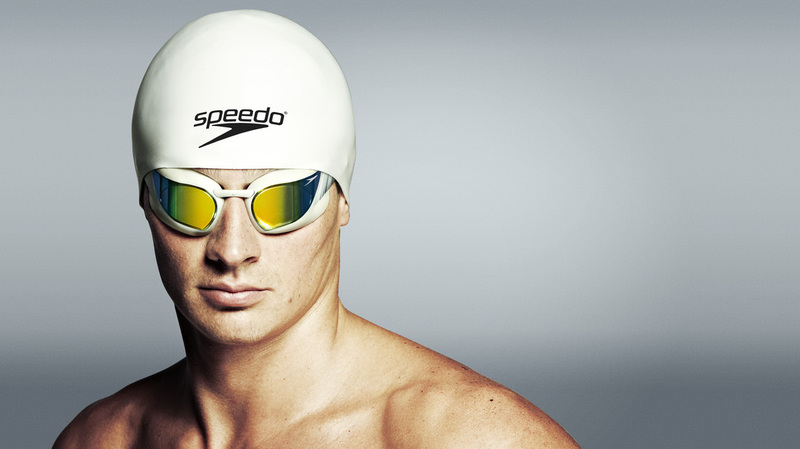 Gold medalist Ryan Lochte swims in Speedo's Fastskin3 system, which incorporates two caps and custom-fitted goggles. In 2008, Speedo got too good at making swimsuits. Ninety-eight percent of medal winners that year wore the company's LZR Racer, a zip-sealed full-body suit that carried many top athletes — including Michael Phelps — to gold. But after those games, the sport's international governing body changed the rules to outlaw the LZR by banning zippers and restricting mens' suit coverage from the navel to the knees. So Speedo went back to the drawing board and spent years developing what's now known as the Fastskin3 system. "Instead of just focusing on one item — the swimsuit — we focused on all the products [swimmers] use," Speedo Aqualab research manager Joseph Santry tells weekends on All Things Considered host Guy Raz. That meant not just the suit, but the swimmers' goggles and cap. Fifty-five-thousand man hours later — and with input from experts in hydrodynamics, aircraft engineering and advanced textile manufacturing — Speedo built a system it says can reduce drag on a swimmer by as much as 16 percent. "What we're confident in is that this Fastskin3 system is the fastest system available," Santry says. To build the suit system, researchers scanned athletes' heads, using 3-D imaging to measure their exact eye-socket dimensions for custom-calibrated goggles. They developed a two-cap system to better streamline drag on the head. And they created a new fabric Santry says only Speedo has access to — one that actually compresses a swimmer's body three times that of the old full-body LZR suits. "We use a fabric that allows us to add compression in where we need it," he explains. "Over the chest, and the hips, and the bum, for example, we need to compress that tissue into a very tubular form." The suit is good, Santry says. But it's not perfect. "Before I came up here to the Olympics, we had been sitting down having quite long conversations about what we can do for 2016," he says. "We want to keep pushing the limits."